A pink and yellow elephant with brown outlines is placed beneath a band that includes a pink hexagon with yellow interlacing. There is additional interlacing in yellow and light blue, all with brown outlines. 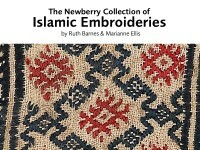 The embroidered fragment is cut into a semicircular shape. The elephant and the interlacing scroll may be compared to one of the Indian block-printed fragments in the Newberry collection (1990.250), which has been radiocarbon dated to 895 +/- 75. This piece also has a similar radiocarbon date of 859 AD +/- 36, with the calibrated result ranging from 880 to 1020. 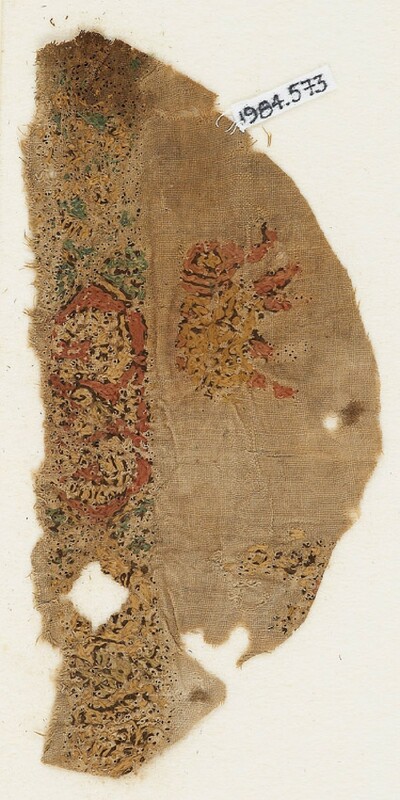 Both textiles are likely to be of 10th century date.